Successfully Added Studio Sonic Wireless Headphones to your Shopping Cart. It's like there's a concert hall in your head! It's like the most amazing rock and roll show ever performed to an audience of one - you! It's like if God existed and she was singing right at you! That's what listening to audio with the Studio Sonic Wireless Headphones are like! Freedom To Move: As an audiophile, perhaps you've turned your back on wireless headphones in the past because up till now there have only been two types of wireless headphones. The cheap ones that make your music sound hissy and flat or the expensive ones that required you to mortgage your house so that you might enjoy music and mobility at the same time. Now there's a third type of wireless headphone as epitomized by The Studio Sonic Wireless Headphones. Inexpensive yet expansive when it comes to audio enjoyment of the highest caliber. And talk about mobility! You can easily walk more than 50-100 feet away from the base and still enjoy crystal clear clarity on these wireless headphones. Freedom To Be Moved: While you're reading these, try to hear it in the voice of James Earl Jones or Morgan Freeman, cause that's what the bass is like when you listen to music with these bad boys! Sweet angelic highs and swing low sweet chariot bass - that's what you get when you put on The Studio Sonic Wireless Headphones. Perfect for any audio occasion from Drum N Bass to Puccini's La Boheme to Lamb of God to Nas. REALLY IMPORTANT - but what really sets these wireless headphones apart from others is the volume. They pack tons of volume especially if you enjoy listening to Death Metal on full blast! The secret to the incredible power delivery is that the base runs on DC power and the headphones derive power directly from AAA batteries. As a result, The Studio Sonic isn't for you if you're into sissy sound, but promises to permanently deafen you if you dare to crank it to full blast! So...do yourself a favor and pick up a pair of Studio Sonic Wireless Headphones and begin listening to your music in a whole different dimension. 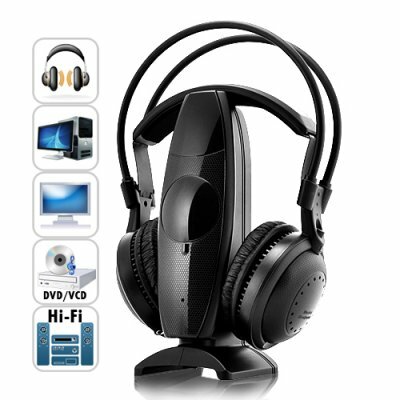 Perfect for music listeners, studio producers and engineers, even DJ's, The Studio Sonic Wireless Headset - brought to you by the audio aficionados at Chinavasion. 2 headphones can be used per base station! The sound quality is so good. I couldnt believe it. Its really like you are in a concert. on 2011-03-07 00:56:00 These phones really work! I could not believe the quality and volume of these phones, and all for under $25, amazing.